Rede Wealth understands that privacy is a concern for visitors to our web site. 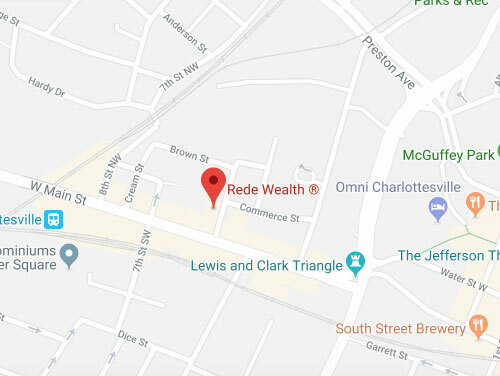 Rede Wealth provides information about our firm on our web site. You can visit our site to read about our firm, its products and services, preview our research reports, use our branch office locator and other features. We provide this information without requesting any information about you. In maintaining the Rede Wealth web site, we gather information about site visitorship. Rede Wealth routinely gathers data on web site activity, such as how many people visit the site, pages they visit, how long they visit, etc. This information is obtained on an anonymous and aggregate basis and it helps us measure the use of the web site’s content. None of the information is associated to you as an individual. We use these statistics to monitor the performance of the web site and to improve it for our site visitors. In certain cases where users may want additional information from Rede Wealth, we will also collect information voluntarily provided to us by site visitors. This personal information includes name, address, telephone and fax numbers, e-mail, as well as other demographic and customer information as may be needed. This information is collected when the visitor supplies information to us using one of our online request forms or contact forms. In addition, we may also request additional information that is collected through our voluntary online surveys. When you provide us with this information, we will not disclose this personal information to any external organizations unless we have previously informed you in disclosures or agreements or unless it has been authorized by you or we are required to do so by our regulators or by law. Rede Wealth will use reasonable precautions to maintain the confidentiality of the information provided to us. Rede Wealth created this website for the convenience of our clients and prospective clients. The information (including text, graphics, and functionality) is presented ‘as is’ and ‘as available’ without express or implied warranties including, but not limited to, implied warranties of non-infringement, title, merchantability, and/or fitness for a particular purpose. Rede Wealth expressly disclaims any liability for errors and omissions regarding the information and materials contained in the website. Due to the nature of the internet, Rede Wealth cannot guarantee the confidentiality, accuracy or completeness of the information contained in this website, information provided via this website, or its suitability for any purpose. Further, although Rede Wealth makes reasonable efforts to avoid technological problems, Rede Wealth is not responsible for any technological problem with the website or with anyone’s use of the website, and will not be liable for any impact these problems may have on users. The entire content including text and ‘look and feel’ attributes of this website is copyrighted by Rede Wealth, LLC (“REDE”) and constitutes the exclusive confidential and proprietary intellectual property of REDE. Any commercial use of this website content requires the written permission of REDE, which consent may be withheld in our sole discretion. All rights reserved. Because of the marked increase in the fabrication and proliferation of computer viruses affecting the internet, Rede Wealth wants to warn you about infections or viral contamination on your system. It is your responsibility to scan any and all downloaded materials received from the internet. Rede Wealth is not responsible or liable for any damage or loss caused by such hazards. This website may provide links to other websites for your convenience in locating related information and services. Rede Wealth does not maintain any of these other websites and has no control over the organizations that maintain these websites or the information, products, or services these organizations provide. Although Rede Wealth believes that the information from these organizations is reliable, we cannot guarantee their accuracy, completeness or suitability for any purpose. Accordingly, Rede Wealth expressly disclaims any responsibility for the content of these other websites, the accuracy of the information on these websites and/or the quality of products or services provided by the organizations that maintain them. Rede Wealth does not recommend or endorse these organizations or their products or services in any way and access to them is at the user’s own risk. You are prohibited from linking to this website from any other website, from framing any of the materials on this website, and/or from suggesting any affiliation or endorsement between us, without our prior written authorization. You may print copies of the material contained in this website solely for your internal use in connection with the services provided to you by Rede Wealth and solely in accordance with these terms and conditions. You are expressly prohibited from selling; distributing; copying, amending; modifying; posting; transmitting; uploading; or similar action regarding the material in this website including: graphics; text; content; logos or the like. Further, you are prohibited and will be responsible for any and all of your unlawful use of this website. If applicable, by requesting and establishing a personalized password, you will have access to the website and the tools and information available through this website and Rede Wealth hereby grants you a limited right to use the website and such tools and information, which right Rede Wealth may revoke at any time. You acknowledge that in order to use this website, you may provide Rede Wealth with non-public personal information and other financial information about your current or potential clients (“clients”). In such event, this information will be stored by Rede Wealth and available to you through the website. You hereby represent that you have all required permission to provide Rede Wealth with this information and will be solely liable and shall indemnify Rede Wealth for any claims that you did not have such authority. You further acknowledge that you are fully responsible for the use of your password, whether authorized by or known by you or not, and the protection of your password and you shall indemnify Rede Wealth and hold Rede Wealth harmless for any claims related to any unauthorized access or use of the website or other Rede Wealth systems, including, without limitation, any claim related to the unauthorized access, use or theft of your clients’ information through the use of your password. You agree to immediately notify Rede Wealth if you become aware of any of the following: (a) loss or theft of your password; (b) unauthorized use of your password or any unauthorized use of this website; and (c) any other information which you believe compromises the security of your client information available through this website. Rede Wealth may change the website or update material without notice. While Rede Wealth may make reasonable efforts to keep the site information accurate, Rede Wealth is not obligated to update or correct information within any specified time period. Rede Wealth is not responsible for information provided by third parties, whether the information is part of this website, is in any linked website, or is information about us that is provided on any website other than this one. Under no circumstances including, but not limited to, negligence, shall Rede Wealth be liable for any direct or indirect, incidental, special or consequential damages that result from the use of, or the inability to use, the materials in this website, even if we or our authorized representatives have been advised of the possibility of such damages. In no event shall Rede Wealth’s total liability to you for all damages, losses, and causes of action (whether in contract, tort or otherwise) exceed the amount paid by you, if any, for accessing this website. You are solely responsible for your decision to and use of this website. You shall indemnify and hold Rede Wealth harmless from and against any and all claims, damages, liability and/or costs relating to you or your agents use of this website. The laws of the state of delaware govern this website in all respects. Any disputes or actions shall be initiated and resolved through delaware courts. You must destroy all materials or copies of materials obtained from this website upon termination. Rede Wealth reserves the right to terminate, without prior notice to you, your access to this website in our sole discretion, including without limitation, for overuse or abuse of this website.